One does not always have to travel far to get an inspiring subject. This one is in my backyard. I liked the different colored flowers planted in different sized pots in the natural setting, but the shadows with the holes where the sun came through the stands and the single solar light, spoke to me… somethings were natural and somethings man-made. Just the right mix. Many of the principles of composition just came together very easily in the painting. 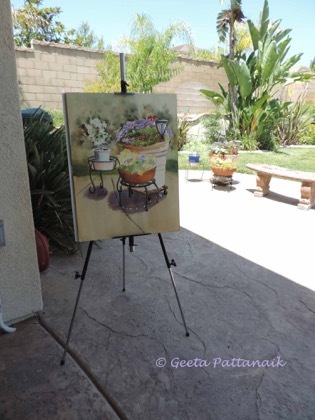 I spent three mornings painting it from the shade of the patio, so the sun was not in my eyes, but the shadows under the subject were the same each day. It is done in watercolor and is 24" x 18". 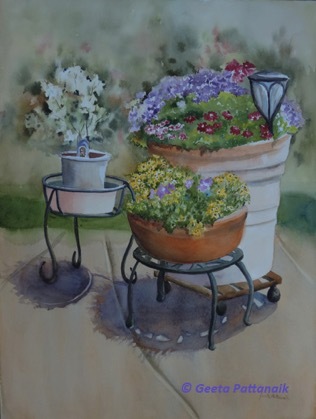 I did not paint the entire background, but blurred it with suggestions of plants by painting negatively, so they are not the exact same things as they are in the setting. I thought it came out as well as I could paint it in 2016, and who knows, I might try it again in a couple of years from photos to get a totally different result. As long as it was my best effort and I did not skimp on time or energy when I did it, I am happy. I loved the flowers in the varied pots so much that a photo I took, went on my e-mailed Christmas card for 2016.